In the temperate rainforest environment of Southeast Alaska, wetlands make up a large portion of the region’s landscape; an aquatic resource that performs many valuable ecosystem functions including providing fish and wildlife habitat, water storage, and water filtration. Land development and other human activities that require dredging, filling, and construction on wetlands and surface waters can significantly impact the functions and values of these aquatic resources. The Clean Water Act (CWA) has measures in place to regulate such activities, in an effort to achieve no net loss of our nation’s wetland functions and values in the face of unavoidable impacts. The goal of SAWC’s Aquatic Resource Mitigation Program is to foster opportunities for communities to grow and develop while maintaining healthy and intact aquatic ecosystems. Our program seeks to utilize the regulatory systems in place under the Clean Water Act to achieve no net loss of aquatic resources, while building up a restoration economy in Southeast Alaska that keeps restoration and mitigation dollars circulating in SE communities. The SAMF operates under the CWA Section 404 Regulatory Program to collect permit funds from developers impacting aquatic resources and pool them together to build and maintain mitigation sites – aquatic resource restoration, enhancement, or creation projects that mitigate for impacts occurring as a result of land development to achieve no net loss of aquatic resource. 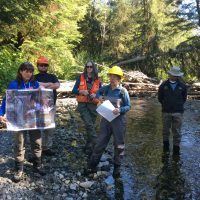 The SAMF was developed as a mechanism to fund and implement stream and wetland restoration in Southeast Alaska, keeping permittee mitigation dollars in the communities where aquatic resource impacts occur. 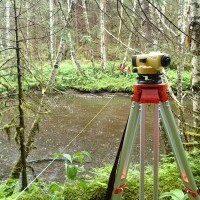 To support the development of the SAMF and the advancement of resource mitigation policies and strategies in Alaska, SAWC works with partners and restoration professionals throughout the region, state, and Pacific Northwest to build tools that inform and support planning for aquatic resource mitigation. SAWC’s Stream and Wetland Credit/Debit calculation tools assist users of the SAMF in assessing proposed mitigation sites to determine the ecological functional lift of the project, and potential funds available for project implementation through the SAMF. 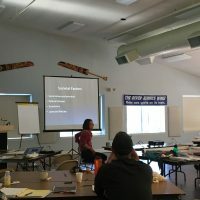 SAWC partners with communities, tribes, NGOs, municipalities, and agencies to coordinate workshops and training opportunities that increase the capacity of our region’s land managers and professionals to identify, plan, implement, and monitor restoration projects that lift the ecological value and function of Southeast Alaska’s aquatic resources.